Ohio State Mansfield students in the 2013-14 school year came from 42 of Ohio’s 88 counties. As the demographics change to a more residential campus, more services will be needed. When Molyet Village first opened to students 10 years ago, the private apartments housed just a few dozen students the first year. The apartments became part of university housing four years later, and are now home to 197 students who attend The Ohio State University at Mansfield. Molyet’s opening signaled a subtle shift from a commuter campus for students in Richland and surrounding counties to an increasingly more residential campus. This year, students came to Ohio State Mansfield from 42 of Ohio’s 88 counties, with the largest growth coming from the northern counties. Mansfield Board member Dave Daniels nicknamed the campus “Buckeye North” for its northernmost location relative to other regional campuses, but also to recognize the growing enrollment from the Cleveland, Akron and Canton metropolitan areas. While Richland County still yields the most incoming freshmen to Ohio State Mansfield (30 percent of the student population), the next largest group came last fall from Cuyahoga County with 16 percent, or nearly 100 students. Faced with an increasing waiting list of students for housing, Dean and Director Stephen Gavazzi worked with University Housing Solutions (which included private developers Adena Corp. and MKC Architects), who now are erecting the first two of five dorm-style housing units along Lexington-Springmill Road that will eventually house 500 students in Buckeye Village. With the opening of the Ohio State Cleveland Recruiting Center last year in the downtown Cleveland Tower City complex, there are even more opportunities for enrollment growth. A college typically is considered residential if more than 25 percent of the students live proximate to campus, according to Donna Hight, Chief Student Life and Retention Officer. If Molyet Village and Buckeye Village fill available beds this fall, the number of residential students could exceed 32 percent. Ohio State Mansfield has taken steps to plan for an increasingly residential campus. Bromfield Library and Information Commons is now a vibrant technology-driven learning environment. University Food and Dining services has expanded offerings to include meal plans, and the cafeteria in Eisenhower Hall will undergo a $1 million renovation this winter to make the space more user-friendly, particularly for residential students. Administrators are seeking funding and community partners to renovate the Campus Recreation Center and Student Union, as well as a partner for student health services. “I really think it’s an exciting time to come together and have conversations about what a residential campus means to how we serve students,” Hight said. This year, our Ohio State Mansfield students come from 42 of Ohio’s 88 counties. We truly have grown beyond a regional campus and into a destination spot for higher education. Sixteen percent of our new students come from Cuyahoga County. Crystal Brown, who hails from Cleveland, has made a real impact on the Ohio State Mansfield campus. Crystal lived on campus and quickly got involved in the Campus Activity Board, as well as becoming a cheerleader for the Mavericks collegiate sports program. No doubt, you have seen her smiling face on area billboards as she represented Ohio State Mansfield in local and regional advertising campaigns. Mikayla Bodey, from St. Paris, a town just north of Dayton, parlayed connections with internship coordinators Pam Schopieray and Tracy Bond into an internship with the National 4-H Council’s Citizenship Washington Focus Program. She is one of nine students from across the nation that have been chosen to participate in this leadership initiative. Many students choose Ohio State Mansfield for the research opportunities available with renowned faculty. Leah Schwechheimer, a local grad and a junior in Biology, teamed with Assistant Professor Carol Landry to study white mangrove pollination in the Bahamas. Leah came back to Ohio State Mansfield from Columbus her junior year for the opportunity to conduct research with Dr. Landry. And her hard work has paid off. She recently received a $3,500 fellowship that will allow her to continue her research this summer in the Bahamas. With our increasingly active recruitment efforts in both the Cleveland and the Akron/Canton metropolitan areas, the numbers of students who choose Ohio State Mansfield as their destination campus to begin college will surely grow. It is imperative that we plan for this growth, both on campus and in our anticipated campus district. Even the most studious of residential students expect on-campus activities nights and weekends, as well as 24-hour dining options. To meet these needs, we’ve made headway with library renovations and the addition of an information commons in Bromfield Hall. In addition, a long-needed overhaul of the Eisenhower Hall cafeteria starts soon. But our key recreational and student gathering areas – the Campus Recreation Center and the Student Union – remain desperately in need of modernization, and therefore are likely to attract our immediate attention once all other renovations are complete. Relatedly, the next phase of our capital campaign will focus on providing a better overall college experience for our students, whether they are here for a year or two, or choose to graduate at Ohio State Mansfield. We ask that you join us in the weeks and months ahead as we sharpen our focus on specific projects and objectives that will be designed to enhance the student experience of our campus. As The Ohio State University at Mansfield and North Central State College begin conversations with the community about creating a campus district, leaders are seeking input about current campus-community relationships through an online survey. “What we hope to get out of this is an understanding of how community residents and employers are currently looking at the relationship to our campus both in terms of the amount of effort they see us putting into the relationship and the comfort level that people have with us,” Ohio State Mansfield Dean and Director Stephen Gavazzi said at a press conference announcing the survey. Residents and employees of Mansfield, Ontario and Shelby are invited to complete the survey, which can be found at http://go.osu.edu/osumsurvey, from May 12-30. Ohio State Mansfield and NC State employees and students will be surveyed in the fall. Staff at the Mansfield, Ontario and Shelby libraries are available to assist those who don’t have internet access. The Mansfield campus is the best kept secret in Richland County, Gavazzi says. “I found that to be slightly disturbing and over time, that so many resources that we have to offer here both on the two-year side as well as the four-year side, have largely gone undetected over 50 years of being in Richland County,” he said. NC State President Dorey Diab added that that in order for the community to prosper, education attainment is key for economic development. 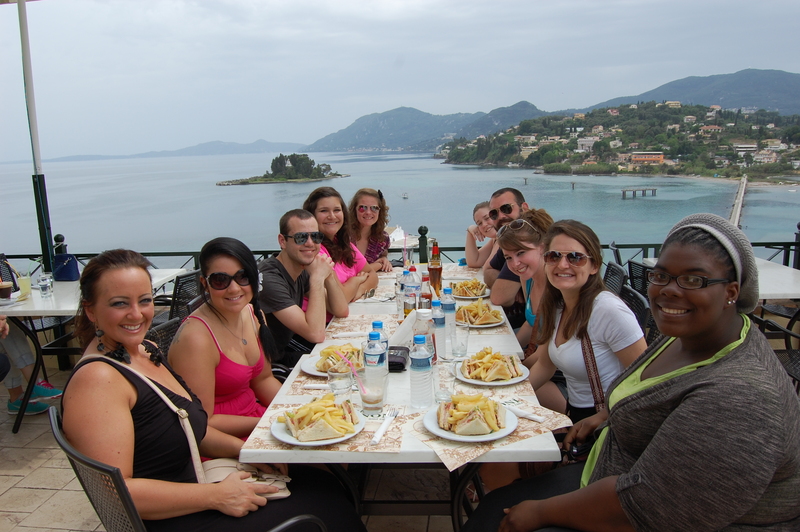 Students from Steven Joyce’s study abroad class last May gather for lunch in Corfu, Greece. This month, two Ohio State Mansfield professors are leading Ohio State students on study abroad trips to broaden their college experience. Steven Joyce, associate professor of German, is leading a month-long trip to Corfu, Greece, while Ozeas Costa, associate professor of Earth Sciences, is spending nine days in Costa Rica with 38 students from Ohio State and community colleges in Georgia and Arizona. It’s Joyce’s second May semester study abroad. Twenty students, including two from Mansfield, will earn credit for Introduction to Western Tradition & Contemporary European Issues during classes taught by professors at Ionian University in Corfu who specialize in topics ranging from ancient to modern age Greece. Group excursions to locations such as the site of the ancient oracle at Dodona and the Byzantine museum in Corfu will allow students to see and experience firsthand what they have learned in the classroom. May semester was created last year as the university transitioned from quarters to semesters. Up to three credits of May semester courses are offered free of tuition, although there is a cost for study abroad travel, lodging, meals and other expenses. The four-week courses allow students to get an extra class in before they head off for summer jobs or other endeavors. The Costa Rica program, Environment and Culture in Costa Rica, includes lectures at Ohio State the first and fourth weeks of the semester, as well as nine days of travel through the country of Costa Rica, visiting coffee plantations, national parks, cloud forests, a nature preserve accessed by boat, and wetlands. In each location, participating students from various programs, including zoology, environmental and natural resources, journalism, environmental health and strategic communications, will interview local managers, ecotourism operators and scientists about sustainability. Every other day, students will have time to reflect on those experiences and how it ties into their own academic plans and perspectives for the future. They will also have the chance to write about their experiences from the perspective of their major. Of concern to both professors was promoting the trips university-wide while working from a regional campus. But social media and word-of-mouth from students, as well as the excellent reputation of the professors, sold the classes. Costa’s students have either taken a class with him, or are friends with one of his students. Students from last year’s trip to Greece posted photos on Facebook of their experiences. This year 50 students applied for the Greece trip, but there were only 20 slots. For many students, it’s the first time they have left Ohio. Instructors, as well as the Office of International Affairs in Columbus, work with the students to prepare them culturally.